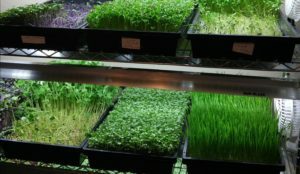 Last month, HUG member James Hinton talked to us about the benefits of microgreens & about his new microgreen business Life Extension Organics. 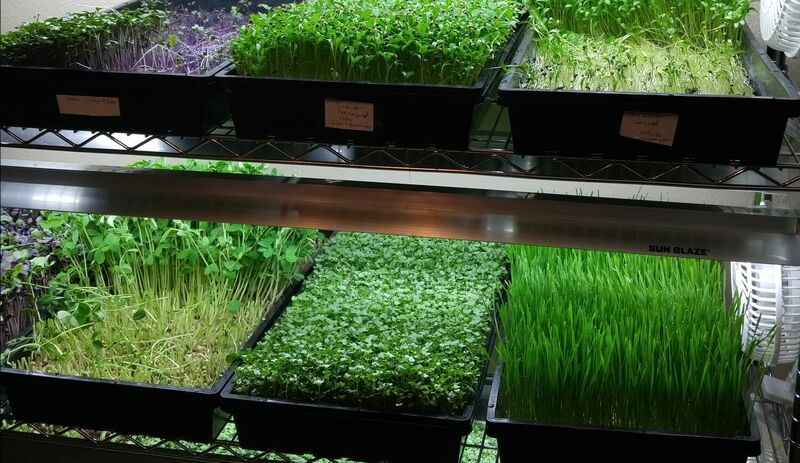 Microgreens are baby plants, harvested right about when they sprout their first true leaves. They differ from sprouts in that sprouts are harvested at a much younger state with smaller leaves & very little “green” and when you eat sprouts you eat roots and all. Microgreens are grown in good nutrient rich soil just like in your garden or on a reusable synthetic mat & with added fertilizer. Sprouts are grown in water and must be carefully rinsed & stored to avoid harmful bacterial growth. Microgreens are also much more nutrient dense than the mature plant. Red cabbage microgreens, for example have 2-3 times the vitamin C as a mature red cabbage according to USDA published measures. Daikon Radish microgreems are extremely high in tocopherols (Vitamin E). James uses 10″ x 20″ trays half filled with soil & compost mix. Seeds are sown very thickly and then kept dark & damp (not wet) via misting until they sprout. James covers each just planted tray with another upside down tray. Then the cover tray is removed & exposed to grow lights. (James grows indoors.) James uses T5 lights & a shelving unit that lets him rotate trays into the light as they grow. He also filters the city water to remove chlorine & contaminants which could retard sprouting or harm plants. He also has a system that gets a much higher concentration of oxygen in the water which he says accelerates nutrient uptake & increases growth. Another tip is to use two trays, one with some holes drilled into it, nested into another without holes. This just reduces mess when removing trays. You also want to have a fan going in the room for circulation & prevent mildew. Harvest by cutting with scissors or invest in a harvesting knife. Few will regrow after harvest. Put the used soil into your compost & start the next tray with new. Get seeds from Mountain Valley Seeds & MySeeds.com. James grows Sunflower shoots, Dun Pea Shoots, Mung Bean, Daikon Radish, Broccoli, Fenugreek, Cilantro, Red Acre Cabbage, Purple Sango Radish, Wheatgrass and blends such as a Salad Mix of Broccoli, Kale, Kholrabi, Arugula, Red Cabbage & Cauliflower or a Spicy Salad Mix which also has Southern Giant Mustard. James sells his sprouts to restaurants for as much as $5 per ounce! James Hinton has always lived a life dedicated to health and fitness by lifestyle, personal training, nutrition programs and specializing in residential and commercial fitness equipment sales. Around 2012, James noticed his brother and wife started to garden which interested him with the healthy foods they produced. James began his journey by starting his own garden which led to spending hundreds of hours researching on the Internet and reading books. In 2015, James obtained his Permaculture Design Certificate through Geoff Lawton PDC course. In 2016, Life Extension Organics was formed which aims to provide cutting edge innovations to maximize quality for agriculture. The first line of extending life is what is put inside the body with nutrient dense foods. Currently specializing in microgreens, other produce and innovations will be deployed in the future to extend life and prevent disease.